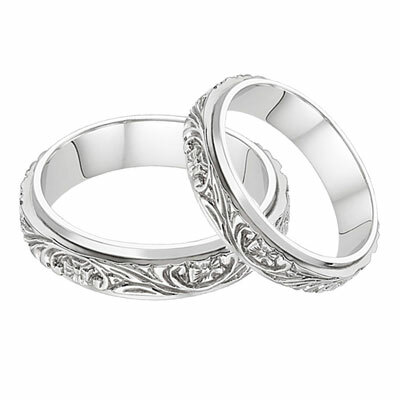 Couples who crave fine craftsmanship and exquisite design need look no further than this floral wedding band set. The timeless appeal of flowers is effortlessly paired with a curling vine motif in these 14K white gold stunners, each carved to create a three-dimensional design that you can see and feel. Two smooth, gleaming edges set off this stunning design, which draws from the past and is perfect for the present. Let the beauty of nature express your love with this gorgeous pair. We guarantee our Floral Vineyard Wedding Band Set in 14K White Gold to be high quality, authentic jewelry, as described above.